My first memory of the concept of “snails as food” is the image of a plastic tube of giant snail shells with a tiny can at the bottom that my mother kept in our pantry of my childhood home. (See the tiny picture at the right.) I’m not sure where it came from, but most likely, it was a souvenir, either brought home by my parents from a trip or bestowed on them by travelling friends. To the best of my knowledge, no one ever ate the snails inside the can, but the tube sat there year after year. Fast forward to adulthood. I know I’ve eaten snails once or twice in French restaurants, but I couldn’t tell you where or when. What I can tell you is that the most memorable thing about them is the delicious garlic butter that is the essence of escargot. Sure, the butter coats the chewy snails and makes them marginally appealing. However, sopping up any remaining butter with fresh bread is the main event. The name of this week’s recipe for Cook the Book Fridays, Green Beans in Snail Butter, was filled with intrigue for me. Based on the title alone, I assumed that snails would be incorporated into some sort of compound butter to be served over the green beans. Fussy and complicated on the face of it. In reality, the recipe is so much simpler. What we’re actually making is that amazing butter the snails are traditionally served in. Instead of providing a bath for snails, green vegetables are immersed instead. Desperate for spring, I had picked up asparagus earlier in the week. I decided to go with what I had on hand. 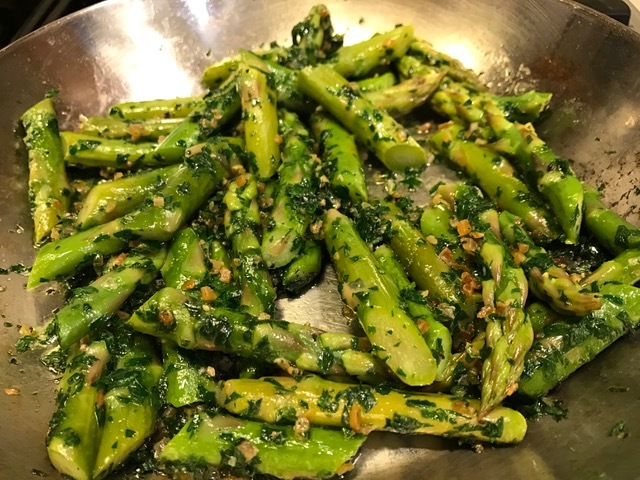 I cut the asparagus spears into green bean length pieces and steamed them. I also discovered that all the heads of garlic I had were spoiled. I had some minced garlic from Penzey’s that I had picked up when I had a coupon for a free jar. I used this instead. 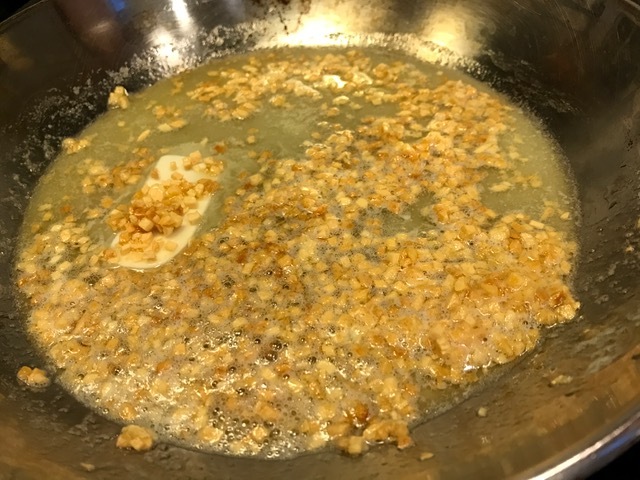 I found that the freeze-dried pieces added a subtle texture, and the garlic seemed to resist the urge to burn that often happens when I freshly minced garlic. Minced garlic sautéed in butter with a generous amount of freshly chopped parsley is about all there is to it before seasoning with salt and pepper and a squeeze of lemon juice. I tossed the asparagus in the fragrant butter and Voila! I will definitely make Snail Butter again when I feel like dressing up green vegetables or maybe fish or seafood. I count this recipe as yet another winner. The asparagus in snail butter was the perfect side for the New York Times’ Roasted Provencal Chicken. You can find the recipe here on Serious Eats or on page 222 of David Lebovitz’s My Paris Kitchen. If you haven’t picked up a copy of this book, I highly recommend it. There are so many delicious recipes that I’ve added to my repertoire. To see what my blogging friends thought of snail butter, check their links here on the Cook the Book Fridays website. Bonus note: Last night, I saw my friend Lisa of Hawley’s Food Path at our garden club’s meeting. We made beaded dragonfly garden ornaments. Here’s a picture of Lisa and me with our finished projects. 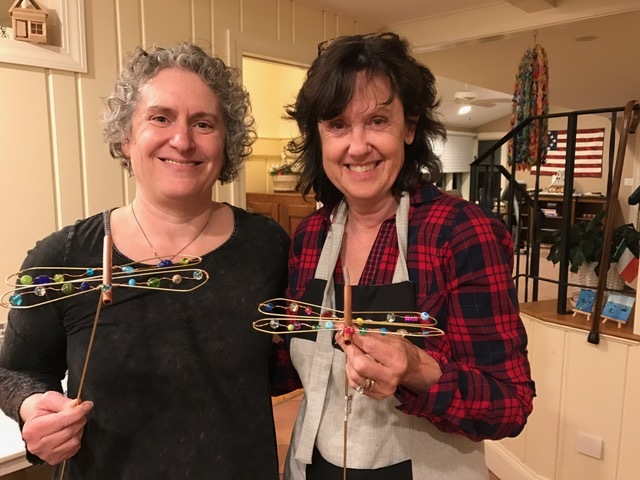 Lisa (right) and Me (left) with our dragonfly ornaments. Happy French Friday! See you in April! I adore anything made in a tart pan: sweet or savory. Hands down, the most used piece of baking equipment used in my kitchen is my tart pan. Quiche is a popular option. It’s a great way to use up leftover bits in the fridge. A pastry shell filled with bite-sized vegetables or chopped meat covered in a custard filling with a little cheese on top, and you’ve got an ever-changing series of options. 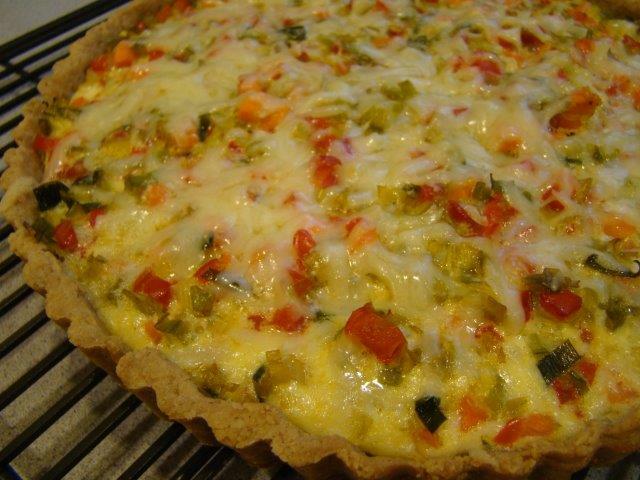 This week’s recipe for French Fridays with Dorie is the Quiche Maraîchère. A Google translation of Maraîchère says it means truck farmer, so we’re talking about a filling that honors farmer’s market style freshness. 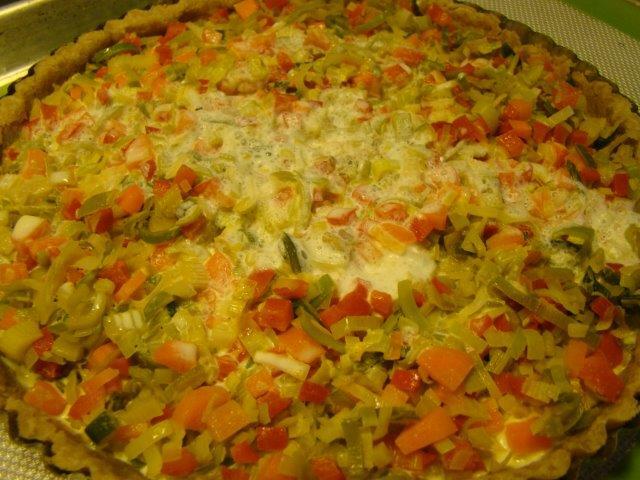 Not much is growing outside in my neck of the woods quite yet, but the filling for this quiche relies on vegetables that are at least readily available at the grocery store all year long: celery, carrots, leeks, and red pepper. I’m inspired to rename this Confetti Quiche based on the vibrant assortment of colors combined for this recipe. I’ve mentioned it before, but I’ll say it again. I’m not a big fan of Dorie’s Pate Brisee. My go-to recipe is Mark Bittman’s though for this quiche, I tried out Maria Speck’s Whole Wheat Butter Pastry Crust (without the sugar) from Ancient Grains for Modern Meals or on-line here. 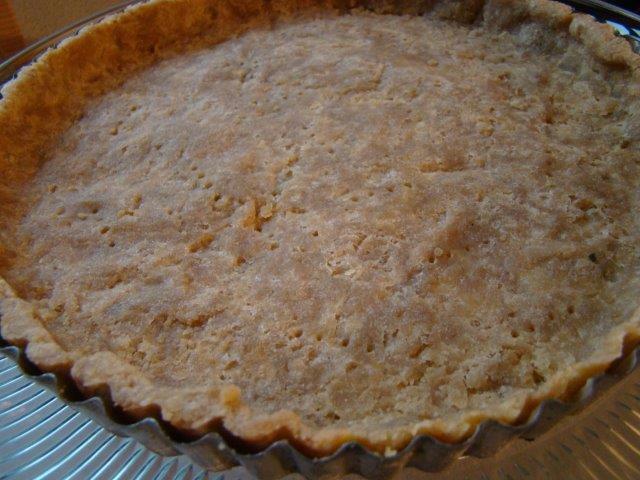 The crust was a little chewy, but much better than other whole-wheat or spelt crusts I’ve tried. I don’t think I used quite enough water so overworked it, making it a bit tough. It is a crust I will try again. As with Dorie’s other quiches, this one has a lower custard to filling ratio which I find quite pleasing (meaning, LOTS of filling bound together with just enough eggs and cream). The only complaint I had with the quiche maraîchère recipe is that, though we were encouraged to add as much custard as would possibly fill the crust without overflowing, the quantity I mixed up per the recipe didn’t even come close to the top of the crust. I could have perhaps doubled the custard to fill it up. It didn’t really matter though. The end results was a feast for the eyes with all those great colors and for the belly too. We both really enjoyed this version of quiche. With a tossed salad, it made a light, but satisfying, dinner. Leftovers were good for lunch too. Carrots and celery were vegetables I’d never thought to add to a quiche, so I’m glad to discover how well they worked. 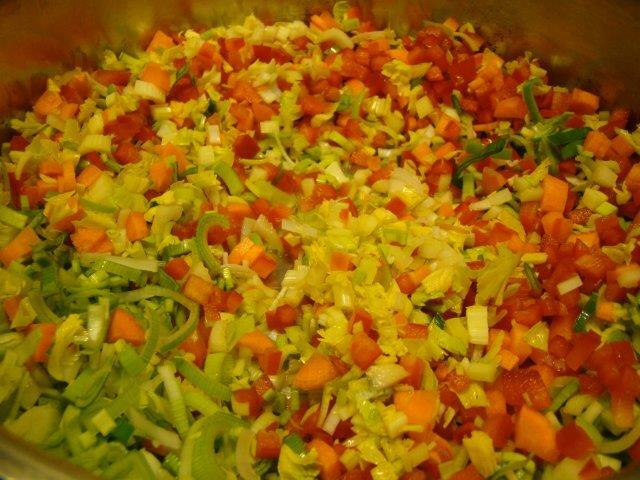 I will be making, if not this exact combination, certainly other versions that include these vegetable bin staples. You can see what the other Doristas thought of this week’s quiche by following their links posted here. You can find the recipe online here, and, of course, it’s from Dorie Greenspan’s book Around My French Table, a book you won’t be sorry to add to your collection.